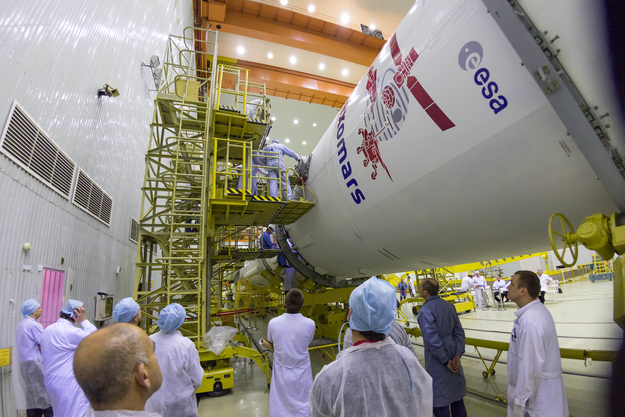 Europe’s ExoMars orbiter, due to begin a seven-month journey to the red planet March 14, has met its Russian Proton rocket booster as launch preparations enter the final stages at the Baikonur Cosmodrome in Kazakhstan. 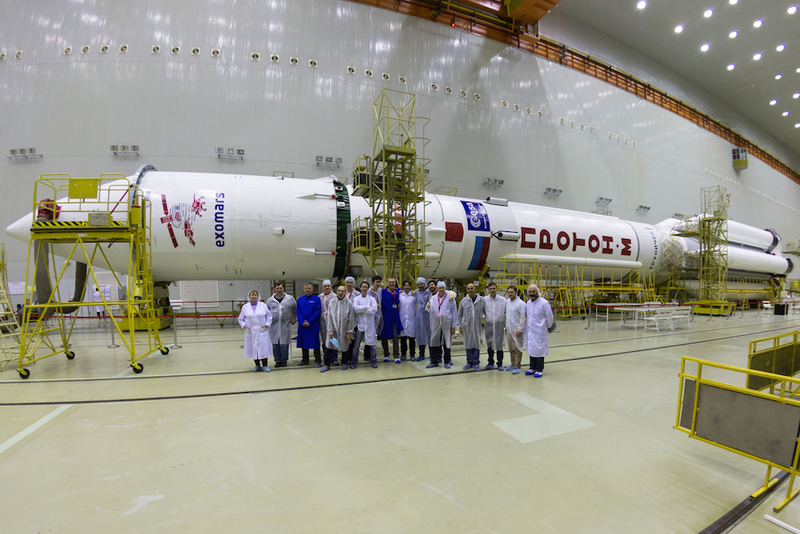 Technicians from Khrunichev, the Proton’s manufacturer, oversaw the connection of the ExoMars spacecraft and its Breeze M stage with the core of the Proton rocket Saturday. 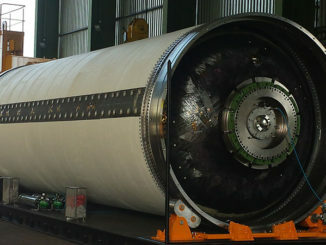 The ExoMars Trace Gas Orbiter and its piggyback Schiaparelli landing probe were transported with the Breeze M to the Proton integration hall at Baikonur, then engineers from Thales Alenia Space, ExoMars’ prime contractor, conducted electrical tests to verify the health of the spacecraft. 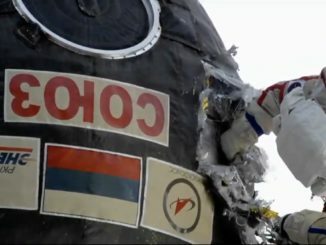 The video below shows the enclosure of the ExoMars spacecraft and the Breeze M upper stage inside the Proton rocket’s payload fairing last week. 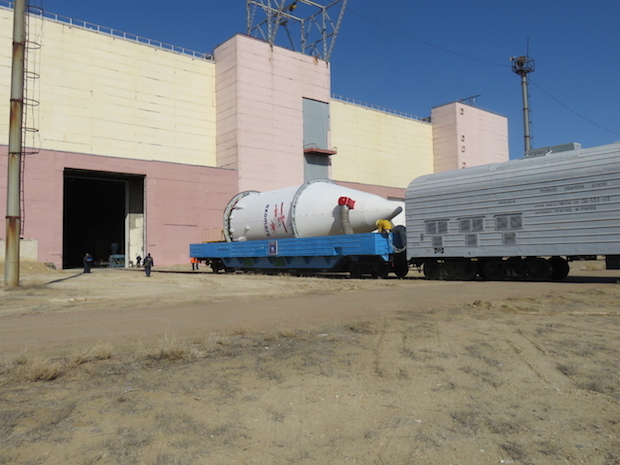 The Proton rocket should reach the launch pad Friday after rolling out on a specialized railroad car and being lifted vertical atop the launch mount at Baikonur. 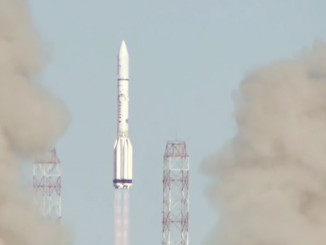 After the launch — set for 0931 GMT (5:31 a.m. EDT) March 14 — the Proton will send the ExoMars orbiter and the Breeze M upper stage on a ballistic trajectory out of Earth’s atmosphere. Then the Breeze M’s main engine will ignite four times to put ExoMars into progressively higher orbits, before giving the spacecraft a final kick to escape Earth’s gravitational pull and head for Mars. Assuming an on-time liftoff, the ExoMars Trace Gas Orbiter will deploy from the Breeze M upper stage at 2012 GMT (4:12 p.m. EDT). Arrival at Mars is set for October 19 after a cruise of more than seven months. Three days before the orbiter gets to the red planet, it will release the Schiaparelli lander, an oven-sized probe that will use a parachute and braking rockets to target a touchdown in Meridiani Planum, a wide, flat plain near the location of NASA’s Opportunity rover. While the Trace Gas Orbiter steers into orbit around Mars, Schiaparelli will enter the atmosphere, aiming to become the first European spacecraft to successfully land and operate on the Martian surface. Instruments aboard the orbiter will survey the Martian atmosphere, detecting trace gases such as methane, and map the red planet’s terrain, with an additional emphasis on charting the locations where water ice may reside just underneath the surface. Schiaparelli does not carry any cameras to take pictures after landing, but it will collect data on Martian dust storms, weather and environmental conditions for up to eight days before draining its battery. The lander’s primary purpose is to prove out technologies — such as a doppler radar — required for the descent of a European rover to the Martian surface after launch in 2018 or 2020.